Motorcycle accidents tend to be more serious than other types of vehicle incidents. The open nature of motorcycles expose drivers to the full force of the impact. Those injured in motorcycle accidents often find recovery takes an extensive amount of time, and some find they can never ride on a motorcycle again. Even if you can still ride, you may be entitled to compensation for the harm incurred. The aftermath of an accident can be confusing and leave victims without the means to pay for the consequences. Medical treatment, transportation costs, lost income, and pain and suffering can tear apart a victim’s life. If someone else caused the motorcycle accident, filing a civil lawsuit is often the only way to secure compensation to cover the cost of treatment and for your resulting loss. At the Law Office of Dennis W. Potts, he understands the time after an accident can be very painful, both physically and emotionally. Attorney Potts has more than 40 years of experience helping motorcycle accident victims. He will fight vigorously to obtain the compensation necessary for restoring your life, and he will work diligently to hold all guilty parties accountable. More often than not, a motorcycle is not the vehicle that causes an accident. Distracted drivers in other vehicles, blind spots, and other acts of negligence often play a part in motorcycle accidents. Cars that fail to exercise caution around motorcycles can easily miss their slim profiles, causing serious injury. In this case, it is vital that you seek damages caused by another’s negligence. 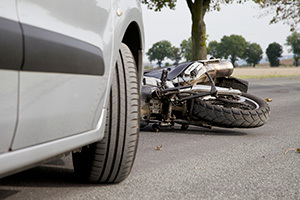 A driver’s negligence, however, is not the only cause of motorcycle accidents. Investigators commonly discover product malfunctions and defects in the aftermath of an accident. In these product liability cases, Attorney Potts can help you hold the manufacturer or service provider liable for the accident. With a large tourist population, rented motorcycles are often involved in accidents on the island. By law, anyone seeking legal action against a liable party must file the lawsuit in either the county where the accident took place, or where the defendant lives. That means tourists and locals need access to skilled legal representatives licensed to practice in the state of Hawai’i. The Law Office of Dennis W. Potts has the resources, experience, and understanding of local and state laws you need to file a successful lawsuit in Hawai’i. Check for injuries. See if anyone is in need of immediate assistance, and call 911 to report the accident and injuries. Wait for medical attention if you are injured. Only state facts to the police, and never admit fault. Exchange insurance information with other involved drivers. Take pictures of the accident and record any details while they are fresh in your mind. Ask witnesses for their contact information. Keep all records of hospital visits and medical examinations. As soon as possible, contact the Law Office of Dennis W. Potts located in the heart of Honolulu, Hawai’i. Attorney Potts offers the guidance you need to determine whether to take legal action against the responsible parties. He works on a contingency fee arrangement, so you will not be charged unless he recovers damages on your behalf. Call today at (808) 537-4575 for more information.